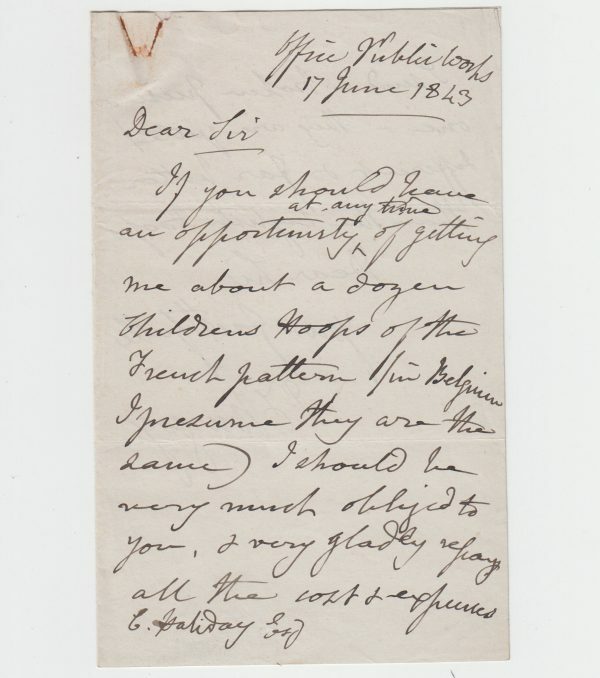 Autograph Letter Signed, to Mr. Haliday, hoping to acquire “about a dozen Childrens Hoops of the French pattern …far better than the English Hoops”. 2 pp. 7 x 4 inches, one paperclip mark, otherwise good. Office of Public Works, 17 June 1843. General Sir John Fox Burgoyne (1782-1871). For his services during the Peninsular War, Burgoyne received the Army Gold Cross, with one clasp, for Badajoz, Salamanca, Vitoria, San Sebastian, and the Nive, and the Military General Service Medal with three clasps for Busaco, Ciudad Rodrigo, and Nivelle. In the War of 1812, he fought under General Pakenham as a Lieutenant Colonel and participated in the Battle of New Orleans. During the Irish Potato Famine, he led the efforts to provide relief from mass starvation. Before the outbreak of the Crimean War, he went to Constantinople to assist in its fortification and that of the Dardanelles. During the siege of Sevastopol, he arranged for the bombardment of Malakoff. His statue is in Waterloo Place.